With more than 50,000 machines currently at customer sites, Fastenal is the dominant leader in industrial vending. Why? It's a combination of our innovative technology, our low-cost/no-risk program, and most important of all, our "machine behind the machine" — thousands of local Fastenal personnel making sure each solution is perpetually filled, functioning, and fully optimized. Fastenal's industrial vending solutions provide point-of-use access to supplies while generating detailed usage reporting to drive consumption reduction. The machines are provided, installed, maintained, and replenished by local Fastenal personnel. There are no long-term commitments or capital expenses — only a low annual software hosting fee and a minimum monthly spend requirement. Explore the machines below to learn more. You can set controls so that workers only have access to products (and amounts) needed for the job. Usage can be tracked by individual employee, as well as department, job number, cost center, location - up to six levels of user-generated information. As a result of this control and visibility, many Fastenal customers have been able to cut consumption by 30% or more. Product is always immediately available to workers, meaning no stock-outs, no need to track down supervisors for needed supplies, and fewer trips back and forth to centralized storage areas. In turn, crib personnel spend less time "standing and handing," and more time on value-adding activities. When stock runs low, an automated replenishment notification is sent to your nearby Fastenal branc, eliminating stock-outs, paperwork, and costly rush orders. As an efficient single source for millions of available parts, Fastenal can supply virtually any OEM, MRO, and Construction product need with a single consolidated invoice, making your job easier and your business more efficient. Fastenal's industrial vending program provides controlled access to inventory 24/7/365, eliminating the need for off-shift/weekend crib labor. Your local Fastenal branch handles inventory acquisition, receiving, and re-stocking, freeing you from these burdens and costs. Access product via ID badge or key code to provide usage tracking down to the individual worker. You can also prompt users to input up to six levels of data (e.g. group, work cell, job, cost center), enabling you to track costs accordingly. View usage during specified time periods or comparative usage over time. Schedule reports to be sent automatically to specified individuals via email. Our automated reports are scalable from bin level, to department level, to plant level, to enterprise level. Have notifications sent to your servicing Fastenal branch when stock falls below the established minimum level. Your Fastenal representative then comes to your site and refills the machine, eliminating POs and stock-out situations. Instantly receive emails or text messages keeping you apprised of any activities YOU want to know about, whether that's a first aid item being dispensed, a machine malfunction, or a sudden change in usage patterns. You can export data to ERP, WM, CMMS, CRM Tool Management, or Excel worksheets. Exports as CSV, PDF, or XML. Fastenal's industrial vending machines are internet appliances that integrate the best available vending technology with secure internet technology. To operate, they only require a 110V AC power connection and an ethernet connection. They use an embedded operating system on the controller board and do not require any software installation. They can be installed inside a company's local area network behind the firewall or anywhere that has a connection to the internet. FAST machines communicate to a remote web server via port 443 using HTTPS. The communication from a FAST machine to the web server is designed to be outbound only. Machines, devices, or computers cannot establish a connection to FAST Solutions® directly. The machines use either static IP or DHCP clients. The machines communicate with the web server over TCP/IP through a secure data tunnel. All transactions between the machine and the web server are encrypted. When a machine is connected to the internet, it will automatically register itself to the web server. The machine will not be allowed to handle transactions until it is provisioned by an authorized administrator from the web site using a special tool. The web server will establish a unique identity for each machine. All vending transactions are logged in a SQL database. Each machine will check in with the web server every 30 minutes to report that it is still operating correctly. Each transaction generated by the machine is approximately 2kb. The network traffic generated by the machines is relatively small, and should not interfere with the performance of a local area network. 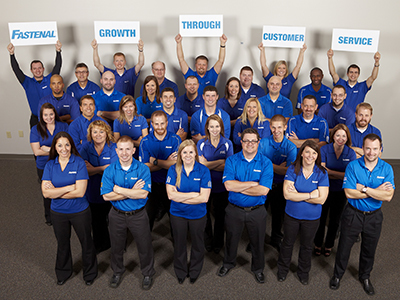 Our Local Sales Force — Product and service are right around the corner at the nearest of 2,600+ Fastenal branches. Your dedicated Fastenal rep keeps the machine filled and is RIGHT THERE to offer suggestions for improvement and handle any issues. Regional Sales Support — Our fleet of display vans allows us to bring the machines and trained FAST Specialists to your doorstep for hands-on demos and in-depth Q&A. Regional Tech Centers — Fastenal operates regional FAST Technology Centers across North America to provide local machine configuration, delivery, installation, training, product testing, and ongoing service and support. The close relationship between the Tech Center and your servicing Fastenal branch eliminates conflicts and barriers, resulting in a fast, seamless transition from signed contract to full implementation. National Distribution and Transportation — Your industrial vending machine is backed by Fastenal's world-class distribution system: 2,600+ local branches, serviced by 14 regional distribution centers, moving millions of products, from thousands of quality-certified suppliers, on nearly 6,000 company-owned delivery vehicles – ALL working to provide the right products, right when and where they're needed.